A $4 million supercar for three owners ! Of all the world's supercar makers, none stretch the idea of an ultimate sports machine quite so far as Lamborghini. For its 50th anniversary, the Italian automaker has created its most bizarre car yet: Meet the Veneno, a $4 million alien craft that will be assembled for only three buyers who've already put down their deposits — and being sold out before it goes into production is only a hint of the Veneno's speed. 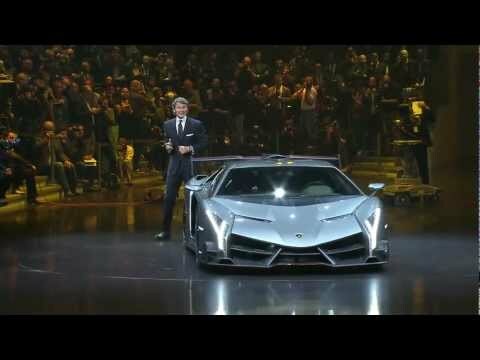 Built from the Aventador chassis, Lamborghini says the Veneno was designed to come as close as possible to a Le Mans-quality race car that's still usable on public roads. Power comes from a 740-hp version of the Aventador's 6.5-liter V-12 linked to a 7-speed automated manual transmission and permanent all-wheel-drive, good for a top speed of 220 mph and 60 mph in less than three seconds. The three copies of the monster from Sant'Agata Bolognese that Lamborghini plans to build will have red, white, or green touches to match the Italian flag; technically, there will be four copies including the test model Lamborghini plans to hold onto. With two of the buyers hailing from the United States, the Veneno will soon enter the rarefied realm of personalized exotic cars — but its fortunate owners would do well to remember what happens when you mess with the bull.